Ellen taught in the Continuing Education program at the University of North Dakota and in the East Grand Forks Public School System. Ellen served on the faculty in the Art Department at the University of North Dakota as a Professor in Visual Arts until her retirement in 1999. A set of eleven prints was produced to commemorate UND's Centennial. Joining ten UND Visual Art's faculty was a former UND professor and Art Department Chair, Robert A. Nelson. 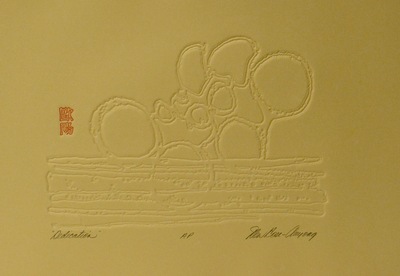 The Centennial Print Portfolio was published in an edition of 75, plus twelve artist's proofs.